As soon as the news of Pon Pon’s arrival reached my BFF Maya, she hopped on the next flight from Portland to come meet the little munchkin, and to rescue us from what is perhaps the most challenging time for new parents – the first week! It was a real blessing to have her in town, not only to be able share this special moment with my best friend, but so that we can receive a much-needed comfort and hands-on, practical advice from a mother with a track record raising a fine, young boy. In between consoling me while I burst into tears for no particular reason (lack of sleep + hormones = one hot mess) and helping me as I awkwardly feed Pon Pon (never thought feeding a baby can be this tough), she ran errands for essentials and even cooked an amazing steak dinner for us! The last time I had Maya’s famous, restaurant-quality steak dinner was back in 2011, after I completed the Portland Half Marathon, as the meal has become a ritual for me and Kevin to indulge after running a race in the Oregon town. It didn’t require me to put on a pair of running shoes this time, but I guess childbirth can count as an athletic event! 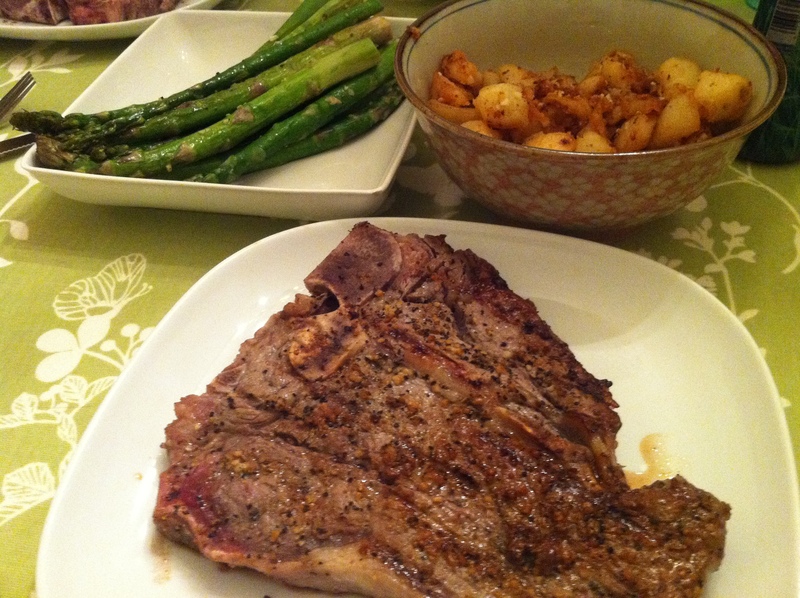 A perfectly-seasoned T-bone steak, cooked to perfection! I usually like my meat medium rare, but I resorted to medium, since I’m breastfeeding. Grilled asparagus with garlic. Look at the size of these spears! This is her famous potatoes. They taste so good, Kevin and I are convinced that they are laced with cocaine. She even prepared a decadent molten chocolate cake for dessert. The chocolate goodness oozed out from the middle! She even went out and got the ramekins because we didn’t have any.